We are delighted to announce that from today our new name is Lifeline Energy. Operating as Freeplay Foundation has served us well for the past 11 years, however, we feel that our new name better reflects our wider mission to tackle energy poverty head-on for the poorest and most vulnerable. In addition to including Lifeline radios and Lifelights in projects and programmes, in the near future Lifeline Energy will launch a brand new, revolutionary communications tool that we believe will have a profound impact on education and information access in the developing world. We will send you more news about this soon. We will continue to focus our research on the impact of dangerous kerosene, firewood and candles, and the harmful effects these have on vulnerable women and children. This better equips us to create clean energy products and to advocate approaches that reduce their use and improve quality of life. 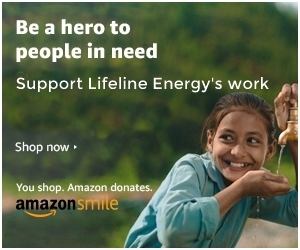 Lifeline Energy remains a 501 (c)(3) registered charity in the USA, a registered charity in the UK and is a Section 18A and 21 non-profit in South Africa. Under our new name, Lifeline Energy will retain all current board members as well as our ambassadors: Academy Award winning actor Tom Hanks in America; noted humanitarian Terry Waite in Europe; Mount Everest and South Pole mountaineer Sibusiso Vilane in Africa. All email addresses that were formerly @freeplayfoundation.org will now be @lifelineenergy.org.